"I have decided to start my 2019 from February 1st, January is my trial month!" With regard to blogging, i followed the above quote. Anyways, can't keep the place silent too long, isn't? Thank you for all those who visited, even though there was not much happening in this space. Now, let us go today's recipe. With Valentine's day around the corner, i thought why not posts some simple dishes that can be made in a jiffy to impress your loved ones. 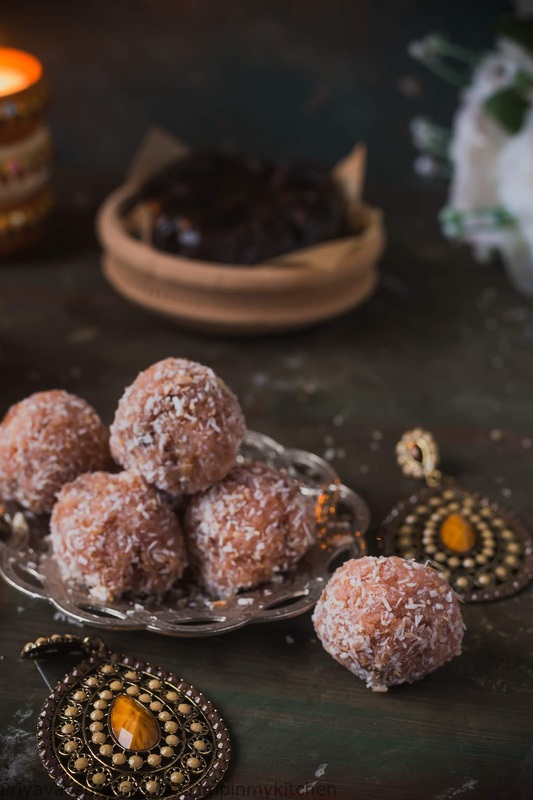 This coconut ladoos, flavored with gulkand and roohafza syrup is a hit amongst my friends. I made around 2-3 dozen of this and the Mango Ladoos for Diwali. The mango ladoos were quite famous with kids and the gulkand with the adults. I made these again for our Christmas get together along with the fruit cake. 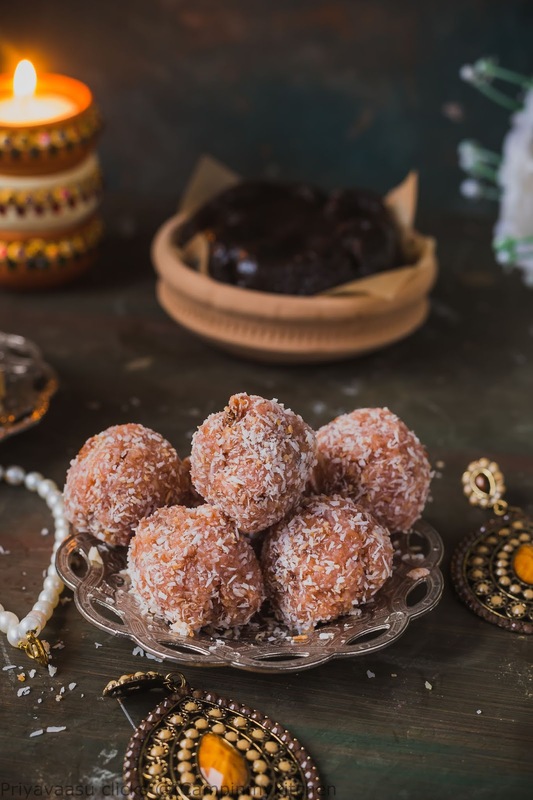 These Gulkand ladoos are quite a treat for ourselves and a great edible gift. If you are someone like me, who always feel that edible gifts hold that personal touch, then this ladoo should definitely be in your list. It hardly takes anytime, quick to make, a treat to look and as well as taste. Do try and let me know how you liked it. To this now condensed milk and pounded cardamom. Keep the flame medium and stir the mixture frequently. Once the mixture comes together as a mass, add gulkand and roohafza syrup and stir well. Take it off the stove and let it cool. Once it comes down and is warm to touch, divide the mixture into small balls and roll it in your palms. Mouthwatering and drooling.. looks simple recipe with less ingredients. Priya, these ladoos look scrumptious, all the nice things in there. Perfect for any occasion. The ladies look so good and with all my favourite ingridients, I am tempted to make these soon. 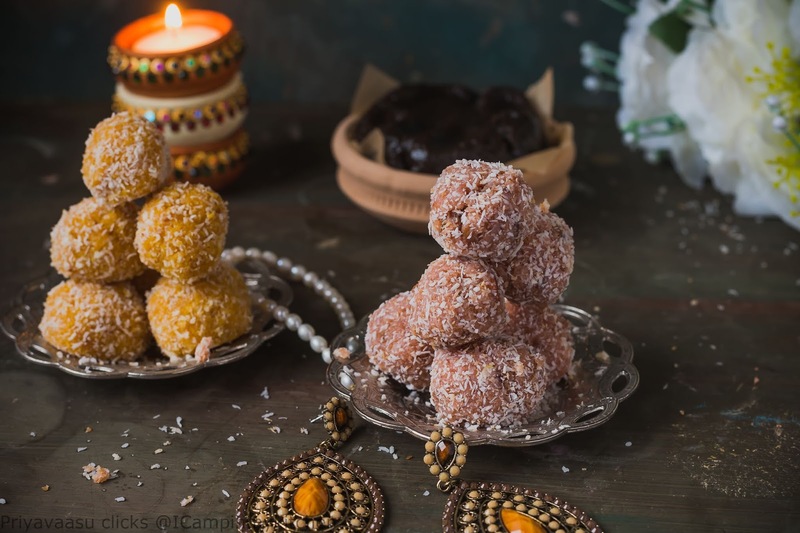 I love making these condensed milk laddoos as its so easy. Adding gulkand is a lovely idea. 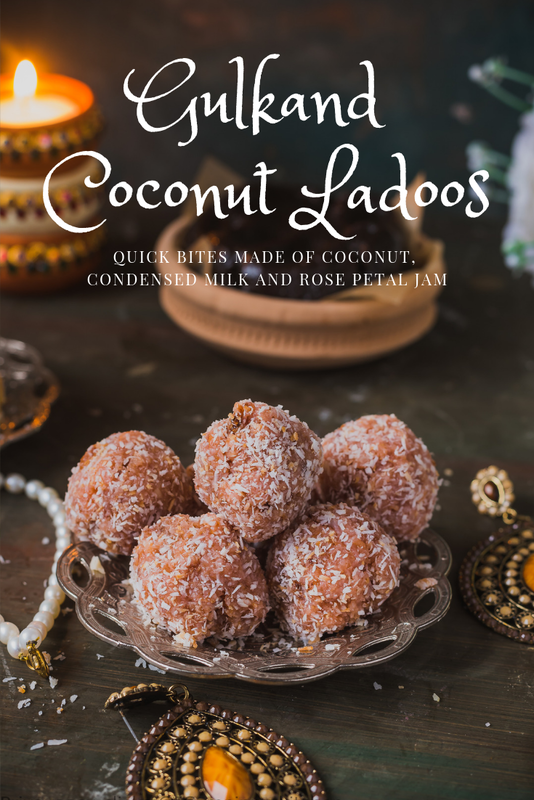 Will keep that in mind when I make coconut laddoos again. I can tell you honestly that these will have to be hidden as I will want to eat everyone of them and not share! I cant wait to try them! This is so fancy! I love everything coconut and don't think I'd be sharing these with anyone, at all! I've never had ladoos before but I love the idea of cardamom and rose petal jam being used together. What a fancy treat! My favorite kind of coconut laddoo. We make the same type of laddoo every diwali. Totally delicious! I must say this is the first time I hear about ladoos but you got me interested. I mean flavors are amazing in these little bites. Cardamon is such an aromatic spice I love it.